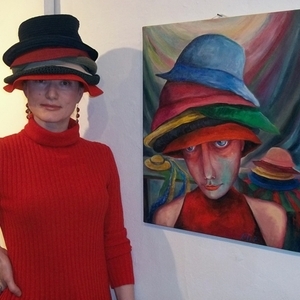 I studied fine art in Russia (Stavropol Art School) and Israel (Betsalel Academy of Fine Arts). I got M.A. Degree in writing in Moscow Literature Institute and D.M. Degree, as well as postgraduate course in psychiatry in Stavropol Medical Academy. 'ROOF CRASH', Bet Ha-Kerem, Jerusalem, July 2015. 'CATS and ANGELS of JERUSALEM', Jerusalem Arts Center, House Of Quality, August 2012. 'THAT'S IT', HaTeva Museum, Jerusalem, October 2010. 'BODY LINE', Lighthouse Gallery, Old Jaffa, 2014. 'Good Morning Tel Aviv', Migdalor Gallery, 2013. 'ARS LONGA', Lighthouse Gallery, Old Jaffa, 2013. 'Jerusalem of Gold', The Culture Center of Russia, Tel Aviv, 2012. 'The March cat', Hillel 27 Culture Center, Jerusalem, 2011. 'City landscape', Harmonia Hall, Jerusalem, 2011. 'Sukkot', The Municipality of Jerusalem, 2010. 'Three days only', Beit Daniel, The Center of Progressive Judaism, Tel Aviv, 2010.